Home. Elderly. Casual Wear. Hospice. This product performs as advertised very well. 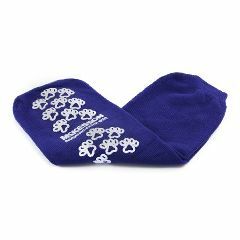 As may have been noted elsewhere in other reviews of this particular product, the non-skid tread is on only the bottom of these slipper socks, and that therefore may shorten the usable life of the product for a long-term wearer. That being noted, the absence of the tread on the top of the slipper sock also won't draw unnecessary attention to the wearers feet. All in all, an excellent product value for money that was packaged well and shipped incredibly quickly! Very pleased with large size of these! Good Fit. Comfortable. Washes Well. Sturdy. My mother has diabetes, obesity, and severe swelling in her legs and feet. I have bought quite a few non slip socks, trying to find ones that were wide enough, not to be too tight. She wears a size 10 shoe also. She needed them to wear during physical therapy,and the nursing home, because she cannot even wear a shoe at this time. These were exactly what we were searching for! A perfect fit for larger feet. I use the foot ware to walk about in the home. I have found that tile and linoleum flooring tends to be very slippery and the socks save me from that. I also find that the socks allow my feet to breath and stay dry. Good Fit. non-slip. cheap price. Good Fit. Comfortable. Washes Well. Good price. Sturdy. My husband wears these at home almost every day. They are warm, priced well and fit a large foot. how wide do the tops of these stretch? Will these socks item 558592 fit someone who weighs over 450 lbs? Are these blue socks anklet or calf height? I agree they are half calf. A good length. I want the Gray Bariatric socks. I wear them everyday . Now no one seems to carry them. I do not want the red or yellow ones to cause attention to my feet. Gray would be ok, but I really like the blue best. They don't fuzz on everything like the red do. I don't like the yellow.